OSH & Fire Safety documentation | CRDR s.r.o. helps us detect the state of your current OSH & Fire Safety Documentation. Our professional auditor maps the workplace, identifies and assesses the potential risks. we mean a single file containing all the mandatory OSH documents. 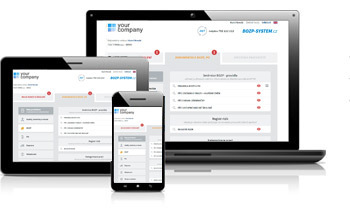 Our BOZP-SYSTEM also provides for a complete management of your documents on-line. and updates will ensure a permanent compliance of your documentation with the law, and a NON-STOP support will help you anytime you are not sure what to do. BOZP-SYSTEM is a revolutionary tool for a comprehensive OSH & Fire Safety management on-line. You will be able to access your documentation 24/7 from any place with Internet connection. The system offers a modern solution using a cloud that is filled with your tailored documentation, offering a comprehensive overview of your responsibilities. By using the system, employers are free of many complications such as remembering the dates of training, checks and revisions which are reminded automatically. BOZP-SYSTEM is fully customizable, thus suitable for any company of any size. Not sure what are your statutory liabilities and need some advice? Do you want to know the exact price for your company? Fill in a simple form and we will immediately respond or create an offer. We usually answer your questions in a few minutes, at the latest in 24 hours.